With the foldable Samsung Galaxy X expected to be unveiled next year, the manufacturer has received a couple of patents, one of which could give us a look at what the Galaxy X might look like. The images show a phone that folds horizontally, unlike a previous patent that showed a phone folding in a couple of different ways. Users would be holding the handset in landscape orientation. Thanks to an additional hinge, the device can be propped up vertically in portrait mode. Shutting the device by folding the two sides together will automatically turn off the phone while opening up the two sides will turn it on. Unlike a regular hinge, the phone would be equipped with a special hinge that would respond to the touch of a sensor. One the latter is activated, the device would fold into configurations that could be preset by the manufacturer. 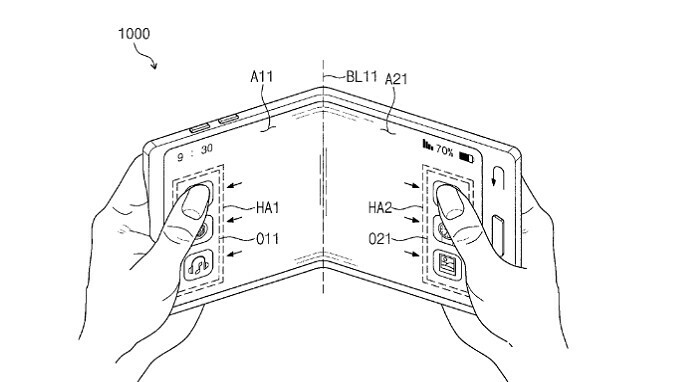 Images that are part of the official patent documentation show a screen in landscape mode split in half by a fold. One drawing shows apps on both sides of the folding display, while another sketch shows an open email on the left side of the screen, and app icons on the right side. In a subsequent image, the email takes up the entire screen. That would seem to indicate that users will be able to choose one of the images on either side of the screen and make it fill the entire display. It sounds like the landscape version of multi-window. Samsung also received a patent yesterday for a transparent smartphone screen. The company unveiled a transparent television screen in 2015, and we'd imagine that the transparent smartphone display will be similar, albeit much smaller (obviously). The see-through screen could also allow for the use of AR without employing a camera to incorporate the real world background used in the feature. You can check out various images from the patents by clicking on the slideshow below. Now this is true innovation rather than putting a notch on the display and calling that futuristic.